Confused about which edition of New Moon you should by? Check out all of the special, deluxe, exclusive, stupendous (lol) editions of the movie below to help you make your decision (or make you more indecisive!). Walmart announced today (2/10/10) it will be the only retailer to carry The Twilight Saga: New Moon Ultimate Fan Edition on standard DVD, and Blu-ray, with never-before-seen footage from the upcoming The Twilight Saga: Eclipse. Walmart also will feature “Twilight Saga Shops” in stores – a dedicated shopping experience for Twilight fans to bite into a variety of Twilight­-themed clothing, jewelry, and merchandise, including new items to show their wolf- or vampire-fan pride. 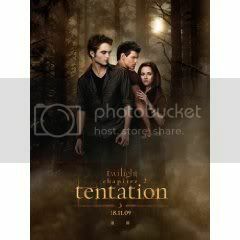 Fans can pre-order The Twilight Saga: New Moon Ultimate Fan Edition on DVD or Blu-ray, as well as the national two-disc Special Edition DVD or Special Edition Blu-ray, at Walmart.com. With the new movie and 50 minutes of extra footage and interviews, The Twilight Saga: New Moon Ultimate Fan Edition also contains an exclusive, 7-minute sneak peek of The Twilight Saga: Eclipse. It begins with an exciting behind-the-scenes look at the production of the newest film. New interviews with stars Robert Pattinson, Kristen Stewart and Taylor Lautner, as well as with series-creator Stephenie Meyer, are integrated with revealing on-the-set footage of some of the key scenes and sets from the upcoming movie. This first-look at The Twilight Saga: Eclipse concludes with the world premiere of an actual scene from the upcoming film. You can pre-order the Walmart version here! 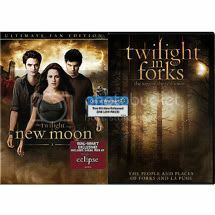 Walmart will also offer the New Moon (2-Disc) Ultimate Fan Edition bundled with the documentary Twilight in Forks for a special price here! You can pre-order the DVD in Canada at Chapters-Indigo. Target will be offering a 3-disc edition of the DVD that includes a special film cell. The set will also be available in Blu-ray. 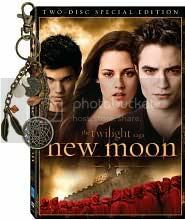 Available Only at Target – The Twilight Saga New Moon 3 Disc Deluxe Edition DVD with Bonus Collectible Film Cell. Included in this edition are the 2 Disc Special edition plus a third disc of never before seen content and a bonus collectible film cell- check back for further details. 2 Disc Special Edition contains over 70 minutes of special features including: revealing feature length commentary with Director Chris Weitz and Editor Peter Lambert; a riveting 6-PART DOCUMENTARY that takes you behind the scenes (Part 1: Life After Twilight; Part 2: Chris Weitz takes the helm; Part 3: The Subtle Details; Part 4: Time to Shine; Part 5: Tricks of the Trade; Part 6: Ready for the World); Band Rehersal Footage with Muse; and Music videos from Death Cab for Cutie, Anya Marina, and Mute Math! Available Only at Target – The Twilight Saga New Moon 3 Disc Deluxe Edition DVD with Bonus Collectible Film Cell. Included in this edition are the Standard Edition 2-Disc DVD plus a exclusive third disc of over 60 minutes of never before seen content and an exclusive bonus collectible film cell. Target Exclusive bonus disc content includes: Deleted Scenes, Introducing the Volturi Featurette, Frame by Frame: From Storyboard to Screen Featurette, Fandamonium: A Look at the Die Hard Fans, and The Beat Goes On: The Music of New Moon Featurette. 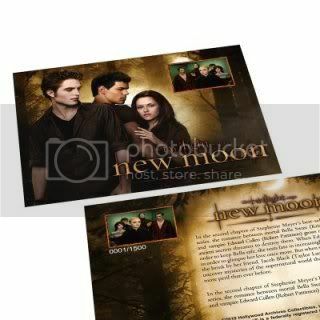 Exclusive Bonus Collectible Film Cell is an authentic reproduction of a cell from the filming of the Twilight Saga: New Moon contained within a beautiful glossy photo. Each is individually numbered with goal foil lettering and measures approximately 5X7. Film Cell included will be one of 250 available collectible cells. Barnes & Noble will be offering the standard 2-disc edition of the DVD but with a bonus bag clip. 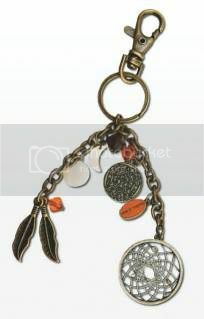 Barnes & Noble Exclusive – This edition comes with a New Moon Dreamcatcher Bag Clip, a metal dangle finished in antique brass that combines a circular dreamcatcher, a sculptural Wolf Pack-tattoo charm, a Wolf Pack jewelry tag, feathers, and crystals. Borders is offering their own special edition with exclusive content, cover and an exclusive medallion necklace. Exclusive packaging that compliments our existing Borders Exclusive Twilight packaging. Exclusive medallion necklace gold side with wolf-pack tattoo, silver side is the Cullen crest on a silver chain. Exclusive content –Includes previously unreleased EXTENDED SCENES; INTERVIEWS with cast members Robert Pattinson, Kristen Stewart, Taylor Lautner, The Cullen Family, The Wolf Pack, The Volturi and Director Chris Weitz; unrivaled RED CARPET FOOTAGE from the movie premiere; front row seats to The Twilight Saga: New Moon WEBCAST. Other content: Additional Special Features Include: A revealing AUDIO COMMENTARY with Director Chris Weitz and Editor Peter Lambert; a riveting 6-PART DOCUMENTARY that takes you behind the scenes; exclusive band REHEARSAL FOOTAGE with Muse; and MUSIC VIDEOS from Death Cab for Cutie, Anya Marina and Mutemath. Best Buy will carry the standard edition DVD, as well as an exclusive steel case version with bonus cell phone skin. HMV Canada seems to be carrying the standard 2-disc DVD with a film cell (no details available yet on the site). Special features include Director Chris Weitz’s commentary. HMV has three special edition covers (above) featuring either Edward, Bella, or Jacob. Each of these are the 2-disc edition DVDs. 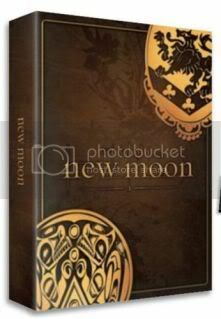 Each exclusively numbered case contains your very own copy of the New Moon double disc packed full of extras. 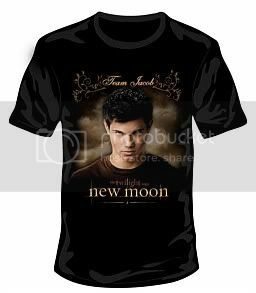 With only 5,000 in existence (exclusive to UK) it’s a must have for any Twilight fan. Play.com features a free key chain with purchase of the 2-Disc DVD. Sanity has the DVD and Blu-ray version up for pre-order, but no details available yet. Music Videos From Death Cab For Cutie, Anya Marina, And Mutemath. If you pre-order the DVD at Sanity you get a 3rd disc containing over 20 minutes of unseen footage! JB Hi-Fi is offering your choice of either an Edward or Jacob t-shirt with purchase of the DVD. You can order the standard DVD here and the special deluxe edition (like the Swedish edition) here. Boxen inehåller dessutom: 2 st poster, bokmärken, 6 st vykort och 2 st armband. Hi, any idea what the options are for South Africa and when it will be available here?? Please help. HAVE TO HAVE IT SOON!! I live in the UK and we have that memory box and the covers with jacob on!!! the memory box one is £64.99 so I doubt i’ll be allowed that.. in the US you have a load of options 🙁 I really like the Wal-mart and Barnes & noble ones. There has been an update to the UK versions listed above. 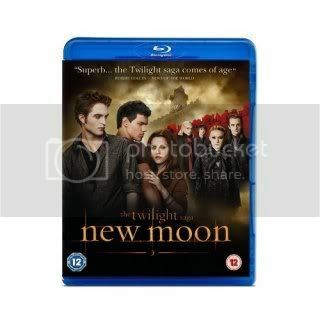 In a press release straight from E1 Entertainment in the UK – they announced that the New Moon DVD and Blu -Ray in the UK will contain a sneak peek of Eclipse, and it will be available on all formats of New Moon (not just specific to a certain store, like in the US). So there you have it UK fans! At least you don’t have to buy different copies of New Moon to get all the bonus features!! FYE/Coconuts also has an exclusive.. it’s the regular DVD and it comes in a box that will be big enough for all the Twilight movies as they come out and it includes photocards. Hey, anyone know how you can/ if you can pre-order target or border versions if your in the UK ? Target did for Twilight? I hope so. I want the Target version too …and what happen to all the deleted scenes in other version??? Wooo I just pre-ordered my copy of new moon 🙂 it officially comes out monday. I can’t wait!!!!!! Será que alguem sabe da versão no Brasil, poxa queria todas pra mim, amei!!!! .. I just saw them when i drove by coming back from moab then saw the photo on FB later. I know the rivers down by millers flat are closed til then, but i’m not sure about this spot. I wasn’t fishing there so i havn7&#821e;t checked. to give you all the information regarding crime rates. I still own today) will probably be worth $170,000 today. what distance it can be for the nearest bus stop or even a local shop. Hope it can help you and you will be able to avoid just about any future problems. positiioned in 1935 to safeguard the public by aiding “to safeguard way of life, well-being, and property, and advertise the general public welfare by furnishing for the licensing and regulating people within the practices of engineering and land surveying. There are many kinds of land titles throughout Thailand, as well as the different titles can know what the land can be employed for. Log in | 51 queries. 1.061 seconds.